Portage junior Katelyn Belleau drives on Baraboo senior Lia Kieck in the first half of a Badger North Conference game in Portage on Friday night. Baraboo senior Alexis Johnson plays defense against Portage senior Tess Wilson in the first half of a Badger North Conference game in Portage on Friday night. Portage senior Gemini Schwantz is fouled under the basket by Baraboo senior Haley Hannagan in the first half of a Badger North Conference game in Portage on Friday night. Portage junior Katelyn Belleau shoots over Baraboo senior Haley Hannagan in the first half of a Badger North Conference game in Portage on Friday night. Entering Friday’s Badger North Conference girls basketball tilt between Baraboo and Portage, it was the visiting Thunderbirds who were riding the hot streak. Baraboo came in having won three of its last four games, including an impressive 55-51 win over Waunakee on Jan. 24. Portage on the other hand, hadn’t won a game in over a month and was riding a 5-game losing streak. But on Friday night, it was Portage that looked like the hot team. The Warriors used an early 9-0 run to take control early and only added to their lead from there, as they cruised to a 63-41 victory. Baraboo (5-15, 4-9 Badger North) took its one and only lead of the night when senior Alexis Johnson scored the game’s first bucket on a layup on the opening possession. But Portage (7-11, 4-7) answered, as senior Tess Wilson, who finished with 11 points, and junior McKena Yelk, who had a game-high 19 points, combined to score all of the points in a 9-0 run that put the Warriors in front for good. Portage was able to use a three-quarters-court press to force the Thunderbirds into making a number of early turnovers. Baraboo coach Michael Behl said his team just couldn’t figure out how to consistently beat Portage’s pressure, which in turn didn’t allow his team to get into its normal flow on offense. Portage started to stretch out its lead by converting from outside the 3-point line. Portage made seven 3-pointers in the game, including one from senior MacKenzie Roth that gave Portage a double-digit lead at 19-8 with just over 9 minutes left in the first half. Portage senior Anika Shortreed came off the bench to make two of her three 3-pointers in the first half. The second of those 3-pointers gave Portage at 28-11 lead with 4:55 left in the half. Baraboo tried to cut into Portage’s lead behind senior Haley Hannagan, who led the T-Birds with 13 points. Her bucket from the left block made it 40-25 with 14:30 to go. Baraboo senior Grace Stuckey drilled a 3-pointer to make it 43-28 with 13:30 to play, but that would be the last bucket for the T-Birds for a while. Baraboo didn’t score again until junior Carly Moon’s layup with 4:50 left, ending a scoreless stretch that lasted 8:40. 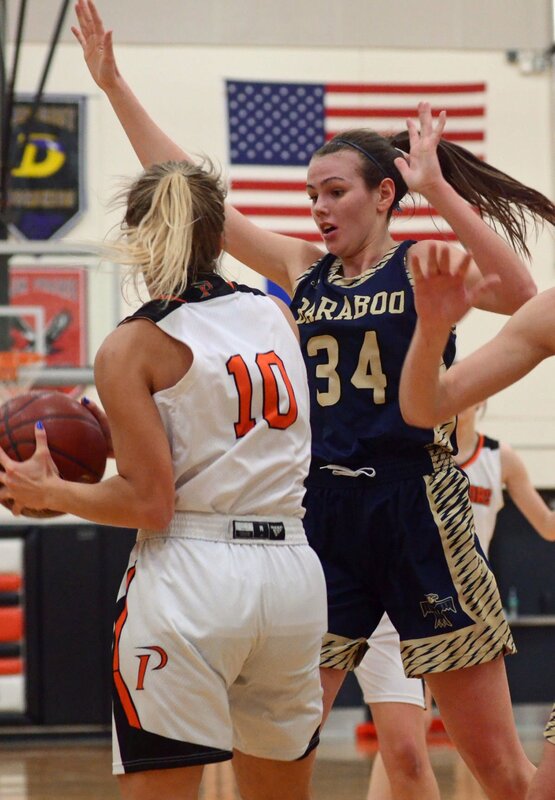 During that Baraboo drought, Portage went on a 15-0 run that included another 3-pointer by Shortreed and six more points from Yelk, giving the Warriors a 58-28 lead. Baraboo did manage to finish the game strong, trimming its 30-point deficit down to 22 points by the final buzzer. Moon made a pair of 3-pointers in the final 1:35 of the game and finished with eight points. Baraboo, which also lost 61-48 to Portage on Dec. 18 in Baraboo, could get another crack at the Warriors. With tournament seeding meetings scheduled to take place this weekend, Behl anticipates his T-Birds will be returning to Portage for a regional quarterfinal game on Feb. 19. Baraboo is scheduled to finish the regular season with a non-conference game at defending WIAA Division 3 state champion Marshall on Monday before finishing the Badger North Conference season with a game at DeForest on Thursday. Portage will finish its regular season with three games next week. The Warriors will host Mount Horeb on Monday, play at Waunakee on Tuesday, before finishing up back at home against Sauk Prairie on Thursday. BARABOO — Kieck 1 2-4 4, A.Moon 1 0-1 2, C.Moon 3 0-0 8, Hannagan 6 1-2 13, Oettinger 0 1-2 1, Horstman 1 0-0 2, Stuckey 2 0-0 6, Johnson 2 0-0 4, Gruner 0 1-2 1. Totals 16 5-11 41. PORTAGE — Roth 2 2-2 8, Wilson 5 1-1 11, Yelk 8 1-2 19, Belleau 1 0-0 2, Nelson 2 0-0 4, Brandner 3 3-4 9, Shortreed 3 0-0 9, Leeland 0 1-2 1. Totals 24 8-12 63. 3-point goals — BAR 4 (C.Moon 2, Stuckey 2), POR 7 (Roth 2, Yelk 2, Shortreed 3). Total fouls — POR 15, BAR 15. The Portage girls basketball team’s offense has sputtered at times this season, but that was far from the case Thursday night.